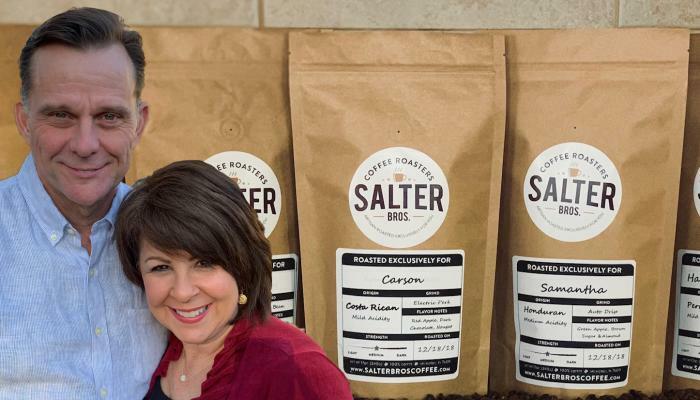 Arlington’s first coffee local roasters, Salter Bros. Coffee, create “artisan coffee roasted exclusively for you,” meaning this roaster creates delicious batches of coffee made-to-order. Selecting green coffee beans from small farms around the world, they embrace the “micro-lot” concept that ensures each cup of coffee is roasted in small batches evenly and never burned. The beans then go into a custom-designed bag “roasted exclusively” for your name, and can include logos, quotes, statements – it’s all up to you. That’s why we wanted catch up with the Salters and talk about coffee, coffee roasting and their place in the Arlington tourism fabric. ACVB: What are your favorite things about Arlington? Cindy: That’s a great question we were literally just talking about that last night. We love about Arlington that it has a real small-town feel, but also all the great things that an established city has to offer. There’s a sense of community here like none other, that’s why we’ve stayed here 24 years, but there’s so many great historical roots here, but then there’s so many forward looking, exciting developments on the horizon and things we’ve seen happening now, like in the Stadium District, Texas Live!, and the Rangers new stadium. There’s old, there’s new, there’s small town, there’s big city, there’s something for everyone here and we just love it. John: We went back and forth with a lot of names and we happened to be in Utah at the time, and I was up early one morning, and I just felt that our name and using a name like “Salter Brothers” just gave it a very homey feel. I have three brothers, and one of them is a little bit involved. Not to the extent that Cindy and I are, but we just felt like it gave it the look and feel that we wanted as a business. We developed our packaging as well around that family-type ownership, and as it is family-owned, it is small as a business, but we feel like we can do so much as a business. We have two sons, and one day, our hope and dream is that we can give this business to them and they are two brothers, so that’s how we landed on the name. ACVB: In the business arena, why did you choose Arlington? John: We looked at a lot of places, and I contacted various cities with regard to how to start a business and working with the different economic development departments around the surrounding area here, and I just found that Arlington was just so easy to work with. Particularly on things that I didn’t really know a lot about, with regard to economic development. They took me and said “look, this is how you do it. This is how we will help you. We’ll guide you along the way.” Also, we found that Arlington was growing at a much faster rate than surrounding areas, and it’s just like America’s Dream City. We just felt that our position, and what we wanted to give and create for the community, this was the right place for it. We wanted to keep it here, to keep our sales in the area, and the community here has been very supportive of us. Thus far business has been open for a full month, and we’ve been received very well by the city, and it’s been a very positive thing for us and we’re so glad that we did decide to put it here. ACVB: Tourism touches everything, especially when you live in a city as tourism-inclined as Arlington. How does tourism effect your business? How do you foresee it affecting your business? John: Tourism is important to a city, particularly a city like this one. I think Arlington’s done a really good job of defining what tourism means to it. With the new developments that are going in like Cindy mentioned, Texas Live!, the new ballpark, and the hotels that are going in, they really redefine the convention center with their [esports] environment, and Six Flags and all the things that draw people here. It’s important that tourism comes into the city for a lot of reasons. It’s an economic boost, it’s a way to show off what you’ve done. It’s a way to have people feel good about coming to your city. What it means to us is that we get to provide the tourist something that they don’t normally get in the city they’re from. They get to experience what we create from an artisan roasted coffee offering. Then, the importance for us is A) we provide them something they are looking for – we’re the only roaster in Arlington, and the tourists get to take their experience back home with them to share with their friends and families that otherwise they wouldn’t get because we exist right here. That’s what’s important to us, it brings things to us, but also tourists get to take things away with them. Cindy: Tourism is so vibrant for the local business community and for all of us here, really. Tourism enhances our hopes to expand our business. I mean, it’s a family-owned and operated business, so that we could look at a brick and mortar opportunity, that when tourists come in, they can say, “wow look at this cool coffee, it was roasted right where I was.” It’s kind of like local craft beer, we’re local craft coffee. And it will have a label on it and they can take it back to wherever they are and take a little bit of Texas back home with them. That’s really our mission, to provide good coffee for people who are local and national. Tourism is just an important way for us to be able to tap in to providing something that people are looking for. ACVB: Did Arlington’s growth over the last five years inspire you guys to create your own business? Cindy: Absolutely. There’s been a lot of expansion, and revitalization in the historic downtown areas of Arlington. By just other people that are living here with that entrepreneurial spirit, the more that comes about, the more other people can get expired and say “hey, I want to jump in and be part of this community as well.” So, yeah, I think it’s contagious. That excitement for what’s going on not only around the stadium, but what’s going on around the Downtown Arlington area and beyond. We’ve been pretty inspired by that as well and that in turn helps us grow, and hopefully we can give back to help other people grow while providing some great local coffee. ACVB: If you were explaining coffee to someone with no knowledge of it, what would your explanation be? What’s the importance of having a local roaster? Cindy: I was talking to a good friend of mine about us starting this business, she was pretty excited because she and her husband like to start their day, you know, the quiet time of the morning over a good cup of coffee. So, I said, “would you try our coffee, and give us your honest opinion about what it tastes like.” She said “it just had that hometown feel to it, and I knew that my friends in Arlington roasted this in Arlington,” and she said – “coffee enhances any moment, any time of the day, you can have conversation over coffee after dinner, it’s a nice warm drink in the morning on a cold day.” I mean, we talked to the mayor about us opening a coffee business here and he said “well I love coffee, and so does my wife and great things happen over a cup of coffee.” So, there’s been a lot of people that have said “I don’t usually like coffee but I’ve tasted yours and there’s just something about it. It’s smooth and I know that it’s homegrown here,” and it’s just a connecter, so, we encourage people to give it a try. What I would say is that if you don’t like coffee, chances are you know somebody who does, and so that’s what we want to offer to our community, something to help them enjoy their day and knowing that it was roasted right down the street is kind of exciting. Kind of like when you get fresh homemade bread right out of the oven, it’s seems a little different than when you get it from the supermarket. I mean, that’s good too, knowing that we roasted it only after you ordered it and you get it within a day or two – and we roasted it just for you to your specifications, it’s taken a different meaning for a lot of people. And then when we put your name on the label, it’s that personal touch that really caused us to start our business. It’s something we believe in and we’re very thankful to have the opportunity to do that right here in Arlington. We’re very thankful to do it right in the Arlington Entertainment District, which is a very exciting, happening place right now. For more information on Salter Bros. Coffee, and to purchase, please visit their website here.